GuitarTownCT Concerts present the Boston-based bluegrass group Mile Twelve at Best Video Performance Space on Saturday, Feb. 9. The show starts at 7:30. The advance tickets for this show are SOLD OUT. There may be some standing room—call (203) 430-6020 after 6 pm day of show to check availability. Mile Twelve is a young Boston band, whose songwriting, well-crafted arrangements and instrumental groove have thrilled audiences around the world. In 2017 they won the International Bluegrass Music Association’s prestigious Momentum Award, and earned IBMA nominations for Emerging Artist of the Year and Instrumental Recorded Performance of the Year. The quintet is comprised of Evan Murphy (guitar), David Benedict (mandolin), Bronwyn Keith-Hynes (fiddle), Nate Sabat (bass), and BB Bowness (banjo). Since their formation in the fall of 2014, Mile Twelve has quickly been on the rise. They released their debut 6-track self titled EP, and performed extensively throughout the U.S., Ireland and Canada, including several major festivals; Grey Fox Bluegrass Festival, FreshGrass Festival, Wind Gap Bluegrass Festival and Joe Val Bluegrass Festival. A track from their debut EP was featured on Sirius XM Bluegrass Junction’s “Hand Picked with Del McCoury”, while another track was featured on Spotify’s “Fresh Bluegrass” 2015 playlist. That same year, they were selected as formal showcase artists at the North East Folk Alliance. 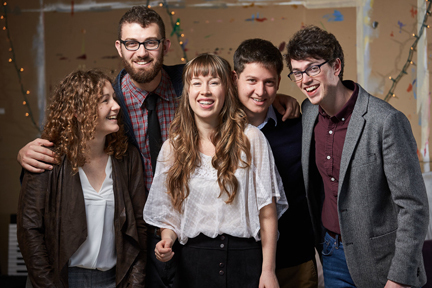 The summer of 2016 held more milestones for this young group: opening for Tim O’Brien at the Station Inn in Nashville, winning the Podunk Bluegrass Festival Band Contest and being nominated for a Momentum Award by the International Bluegrass Music Association and adding a fifth band member: mandolin player David Benedict.